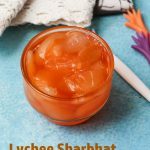 Lychee Sharbath is a delightful thirst quencher. Peel and deseed the lychees. Chop them into bite sized pieces. Add in lemon juice, water and nannari syrup. Gently mix them. Lychee sharbath is now ready to serve. I used store bought Nannari. It had lemon in it and was slightly sour in taste and hence did not add in lemon juice into the recipe. There is a variety of lychee in which the flesh does not stick to the seed. Such lychees are easy to chop and deseed.